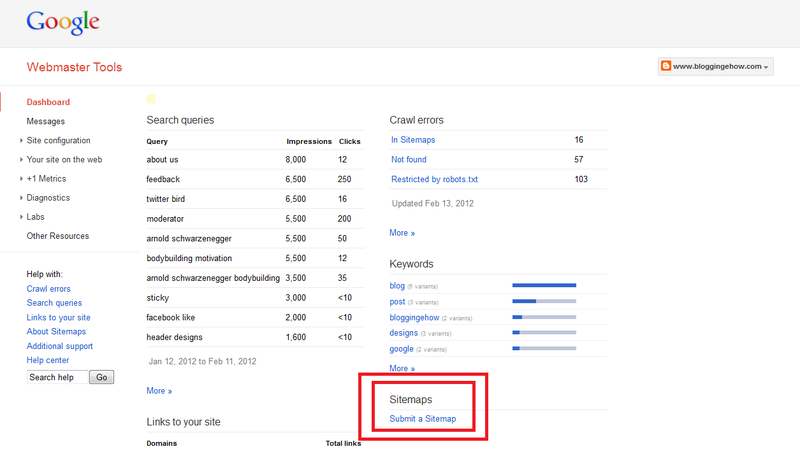 Yesterday i posted the easy way by which we could make 2 different types of sitemaps for our blogs. One being XML or HTML sitemaps. They both are used in different conditions that the following post would refer to in a detailed way. XML Sitemap VS HTML Sitemap Of A Blog- Which One Is More Important? So today, as i promised lets discuss how we can submit our XML sitemap to Google. Why we are doing this? This is because we want Google to know about the articles that we have published on our new blog. Although if you would leave out your blog for around 15-30 days your blog would already get into Google. But with the help of sitemap the process would get a bit faster. So lets start out and look into the steps by which we can submit our XML sitemap to Google (webmasters tools). You would get to see the following page. 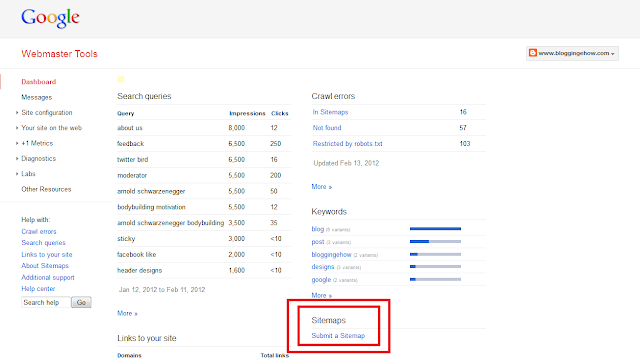 As i have already submitted my blog to Google, its showing up in the dashboard. But in case you haven't (and your blog is not visible in Google search) you can click 'Add a Site' button. Once your blog shows up, simply click the blog link as shown in the picture below. Now once you enter your blogs dashboard, you would get to see a new page (shown in the picture below) where you would find a link ' Submit a Sitemap'. Next click the button that says 'Add/Test' Sitemap. Once you click the button, a new blue pop type window would appear where you can mention the link of the sitemap that you previously uploaded to your blog in the post mentioned in the starting of the post before. In that post we ended up with a sitemap that we uploaded to our blog. So in this step, you need to submit that link in the space provided here. Say you uploaded your sitemap to the root directory of your blog or in case you didnt had the access to your root directory (in case your blog is hosted on blogger servers), either way, you need a link to upload the sitemap to the Google webmasters tool. So once your mention the link in the field shown above, simply click 'Submit Sitemap'. And your job is done! Even though i mentioned that you only need to submit a sitemap in the early days of your blog so that search engines get to know your blog in a better way and could index your content much efficently. So i hope, that was pretty easy to follow and in the case of any help, do leave out a comment below. Would love to hear from your guys.